In 1903 the ardent promoter of the cultures of the Southwest, Charles Fletcher Lummis, took on an immense project. With his charter in hand for the Southwest Society, a chapter of the Archaeological Institute of America, he purchased an Edison wax cylinder recording machine and proceeded to “catch our archaeology alive” by recording hundreds of the disappearing songs of the californios and Native Americans of the region. Those of the Edison wax cylinders that are still extant reside at the Southwest Museum’s Braun Research Library in Highland Park, now part of The Autry Center. This music book reflects a small part of that collection — specifically the songs that Lummis collected from Francisco Amate, a traditional Spanish bard. The transcriptions include lead lines, with harmony lines for many pieces, and the accompanying chords are indicated for guitar players or other chording instruments. The books are bound in comb bindings so they’ll stay open. Also included is an Index, a First Line Index and a Phrase Index. These transcriptions finally make this music accessible and available for performers and scholars. All of these pieces are included in the ten-volume Music of Early California collection, although they are scattered among the various years. If you already have that work, you may not want this one. A number of pieces from Francisco Amate’s repertoire are preserved on Lummis wax cylinders. 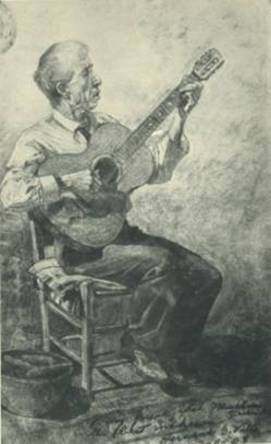 This drawing is by Hernando Villa, a californio descendent whose own family was also featured in Charles Lummis recording project. Although Hernando was himself a musician and singer, there are no Lummis recordings of him.